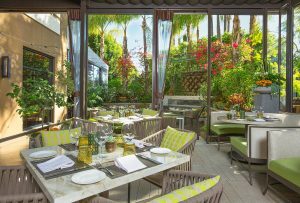 The five star Four Seasons Hotel Los Angeles at Beverly Hills offers a variety of luxurious amenities that will appeal to every guest. 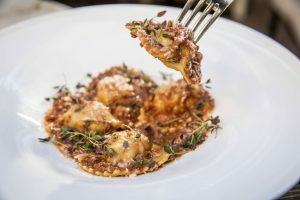 The hotel, situated right in the heart of Beverly Hills, boasts its own in-house Italian restaurant, Culina, an award-winning culinary experience that perfectly captures the cosmopolitan vibe of Los Angeles. Chef de Cuisine Luca Moriconi allowed us an inside look at his philosophy and his process from farm to table. Your Father was a farmer, how did that influence you as a child? For us it was normal to have high quality organic products. The house was always filled with fruits and vegetables. He was also a hunter, so we always had game in the house. When it came time to make a menu, the products in our house influenced every dish. What role did your mother play in your choice to become a chef? Having all the ingredients at home, it was a natural thing to cook, ALL THE TIME. It wasn’t a hobby, it was a way of life. We were always gathered in the kitchen, cooking, eating, talking, and drinking great wine. On the weekend, the entire family was gathered, sharing dishes. Every mom in the family brought food over, and the house was FILLED with great food and drink. As a child, there was no “kids food”….we always ate everything together, we all had the same thing. What is the greatest lesson your mother taught you about cooking? It’s simple…No compromise. No recipe is changed, no matter what. It takes generations to perfect a dish, so nothing is to be compromised. Having recently moved to LA, where do you go to seek out ingredients and inspiration? Santa Monica farmer’s market. In addition, I have 6-7 Italian suppliers that import the best Italian ingredients to complete my dishes. If you could go food shopping for ingredients anywhere in the world, where would you go? Italy, of course. My home town of Lucca. I would walk from my house to the local butcher, I knew him well, his beautiful wife and kids. The relationship our family built with his family was evident in the food he set aside for me. The food would speak to us, and we would share recipes and stories of the ingredients we shared. The menus we created were not about “what”, it was about “why” these ingredients were there, and the stories behind them. For a long time, chefs were more about number of items sold, and not the quality. They forgot about meeting the butcher and meeting the farmer. Fortunately this is turning back around to the “old school” way, when relationships with the people mattered, and it showed in the quality of the ingredients. How has your cooking style changed over the years? When you start cooking with mom, you cook…her way. You go to school and you think you need to learn the “perfect” cutting method, the fancy way of cooking, the official way to make the dish. In the end, you realize that the best dishes come from a combination of old school and new methods. Learn the proper way, but have the heart that was taught as a child. Why should locals visit Culina? I’ve spent many years of my life with Four Seasons, learning what the guests want and how to give it to them. 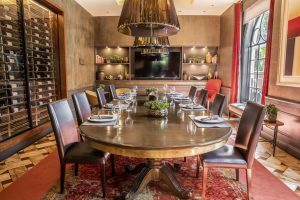 Having travelled the world, seeing amazing products, dishes, and techniques from around the globe, I present each and every guest with a menu that is time tested. Cooking is in my blood, and the way I cook is passed down from generation to generation. I have the amazing opportunity to create a menu that is truly authentic, the way Italian food is meant to be enjoyed. Add that with a great bottle of Italian wine, and it’s a true Culina experience every time. How would you sum up your cooking philosophy? I have a Tuscan mind, but a worldly palate. Learn more about Culina and Chef de Cuisine Luca Moriconi below.